ST. CROIX, U.S. VIRGIN ISLANDS – About a third of the power on the island of St. Thomas has been restored, Governor Kenneth E. Mapp said Monday. Speaking to reporters, Governor Mapp shared that the Virgin Islands Water and Power Authority (WAPA) reports St. Thomas had 32 percent of its power restored while 15 percent of electricity has been restored in St. Croix. He expects Cruz Bay, St. John to be energized by Wednesday, which will bring power restoration on that island up to 25 percent. There are more than 410 linemen on the ground with more than 300 pieces of equipment in the Territory. WAPA announced more than 300 new poles have been installed in the Frederiksted, St. Croix area. The Governor is assembling a team from the U.S. Virgin Islands to travel to Washington, D.C. on November 7 and 8, where he will join Puerto Rico Governor Ricardo Rosselló to brief the United States Senate on the state of the territories following back-to-back hurricanes. Governor Mapp will meet with relevant Cabinet secretaries to make a case for the U.S. Virgin Islands’ need for continued help and support for its reconstruction. 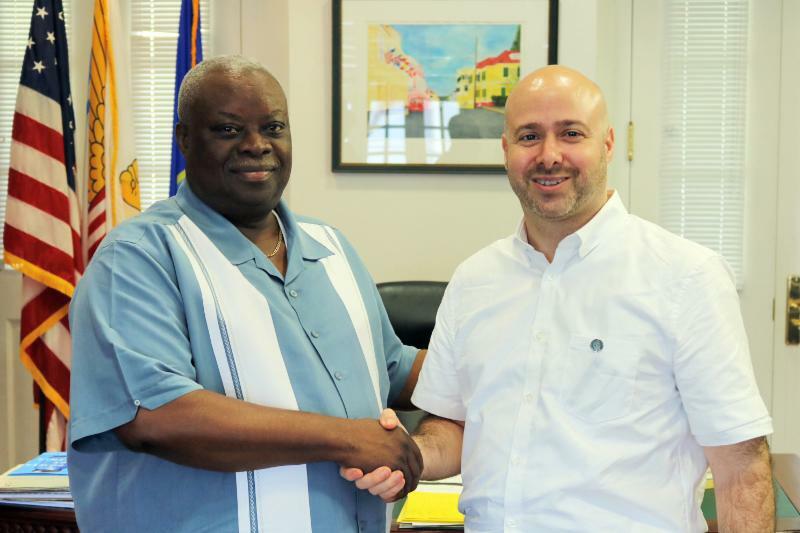 Governor Kenneth Mapp (left) meets with Jason Botel of the U.S. Department of Education on Monday. “It’s not about a handout, it’s about getting the help. It’s about demonstrating who we are as a part of this great nation and ensuring that the American citizens … the people of the U.S. Virgin Islands are in fact taken care of,” he contended. Referring to the Gov. Juan F. Luis and Schneider Regional hospitals, the Governor stated: “We cannot in good conscience – and safely – provide the [required] level of medical services for patients in our hospitals for any reasonable extended period of time … the hospitals are really damaged.” He added that medical evacuations must continue for patients who require hospital stays. Replacement modular systems, portions of which have begun arriving in the Territory, are expected to open around December 10. Governor Mapp commended the Territory’s medical professionals for their efforts. Earlier on Monday, the Governor and Commissioner of Education Dr. Sharon McCollum met with Jason Botel, the U.S. Department of Education’s Acting and Principal Deputy Assistant Secretary for Elementary and Secondary Education, who landed in the Territory on Sunday to witness the damage in the Territory’s schools. Governor Mapp announced the Territory-wide curfew is being reduced, effective October 24 through November 2, from 11 p.m. to 5 a.m. The Governor noted he will be traveling out of the Territory Tuesday and that Lieutenant Governor Osbert E. Potter will serve as Acting Governor during his absence. On Monday, the Federal Emergency Management Agency (FEMA) began collecting resumes and applications for local hires from St. Croix, St. John and St. Thomas, reported William L. Vogel, Federal Coordinating Officer of FEMA Region II. Resumes can be delivered to the Department of Labor on St. Croix and St. Thomas from 10 a.m. to 4 p.m on Tuesday, October 24, or sent to fema-workforce-caribbean@fema.dhs.gov. Interviews will be conducted later this week. “We’ll be here for the long haul … we will be here until we are no longer needed. We’re happy to do whatever we can in order to be able to help you recover,” Vogel said. Anyone experiencing psychological distress as a result of the hurricanes can call the Disaster Distress Helpline at 1-800-985-5990 (press 2 for Spanish). The helpline provides free, confidential and multilingual counseling and crisis support. The helpline can also be reached via SMS by texting talkwithus (for English) or hablanos (for Spanish) to 1-212-461-4635. Residents can register for disaster assistance by calling 1-800-621-3362 or visiting www.disasterassistance.gov. The official website to donate to the U.S. Virgin Islands recovery effort is usvirecovery.org.